Christina began teaching at the RCS in 2014 and has been teaching professional classical and opera singers and students since 2007 whilst maintaining her career as a soloist. She graduated from the Opera School at the RSAMD, then studied with famous tenor Juan Oncina in Barcelona where she took part in the Franisco Viñas Masterclasses. 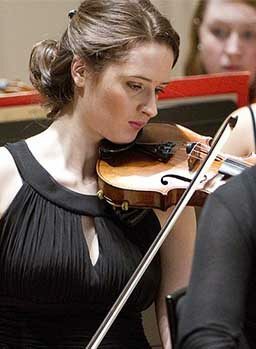 In her career as a soloist opera she has worked in the UK for Scottish Opera, English National Opera and in Germany. Highlights include singing the role of Desdemona in Verdi’s Otello with world famous Heldentenor John Treleaven and singing the title role in Lucia di Lammermoor for Scottish Opera. Roles she has performed include Abigaille – Nabucco, Desdemona – Otello, title role -Tosca, Mimi – La Boheme, title role -Aida, Giovanna – La Prigione di Edimburgo, Violetta – La Traviata, Lady Macbeth – Macbeth, Marguerite – Faust, Countess – Le Nozze di Figaro, Donna Anna – Don Giovanni, Fiordiligi – Cosi Fan Tutte, Dido – Dido & Aeneus, Rosemene – Imeneo, La Femme – Le Pauvre Matelot, Micaela – Carmen and Medea. She recently she sang the title role in the world premiere of a one-act opera, Medea Jazz, by composer Derek Williams. As a concert and oratorio singer she has performed in Germany, Italy, France, Russia and the UK. Christina was Artistic Director and Founder of the critically acclaimed, award-winning company Opera on a Shoestring. She has also won the Scotland on Sunday Paper Boat Award for La Traviata and The Herald Spirit of Mayfest Award for TOSCA. She was engaged in the running of the company for 3 years including choosing repertoire and casting. Company members included Martin Fitzpatrick (Head of Music ENO), Terry Gilbert (ballet dancer, director and international choreographer of opera with John Copley and film with Ken Russell), Annette Gillies (BAFTA winning designer) with a long career in Film, Television and Theatre. Many singers had their first professional roles with Shoestring. including Alison Cook, Peter Wedd, Peter Auty and Ian Patterson and renowned composer Edward Rushton was the first Assistant MD of the company. For EGO she directed productions of La Prigione di Edimburgo (UK Premiere), Carmen at the Lyceum, Don Giovanni at The Queen’s Hall and La Traviata at the King’s Theatre, Edinburgh. The professional casts included graduates of the RCS. Christina is the Artistic Director of Primavoce dedicated to performing stimulating innovative operatic. Recent success includes ‘Torch Song Divas’ starring Christina and Elaine C Smith with Tosca at Oran Mor and Haddo Festival coming soon.